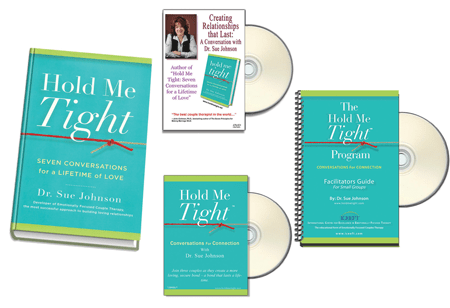 This DVD shows three couples who – with the help of Sue Johnson – go through six of the conversations from Dr. Johnson’s ground -breaking book, Hold Me Tight: Seven Conversations for a Lifetime of Love. 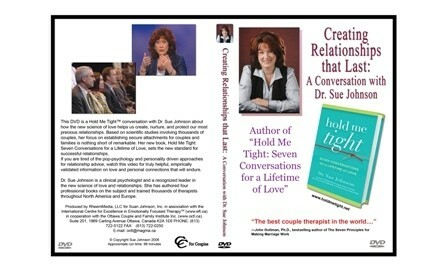 This DVD can be used on its own as a roadmap for creating loving connection or it can be usin in conjunction with the book. The conversations shown are based on Emotionally Focused Couple Therapy (EFT), a scientifically proven approach to improving relationships, shown to help 7 out of 10 couples move from frustration and loneliness into a secure loving bond. You will see couples, just like you, moving through six conversations.